Frost & Flame has been the trusted name in home heating for the past 37 years. So when we decided to add awnings to our product lines, we chose SunSetter Awnings, America’s #1 selling awnings, as our partner to best serve you our customers. A SunSetter will transform your deck or patio into a beautiful "outdoor room" where you and your family will love to spend time. Don't let hot, glaring sun or light passing showers drive you from your deck or patio. With a SunSetter, you control the weather. Enjoy the outdoors rain or shine. A SunSetter gives you shade and protection when you want it, but retracts when you want to enjoy the sun. A SunSetter is like having outdoor air conditioning - it can be up to 20 degrees cooler under your awning. A SunSetter can even help cut your air conditioning costs. By blocking the sun from walls, windows, and sliders, your SunSetter helps keep the inside of your home cooler, and prevents carpets and furniture from fading. With a SunSetter, you never have to compromise on beauty, quality, protection, or safe, easy, reliable operation. 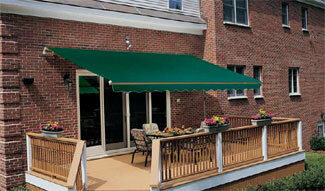 It's a fact: You can pay more, but you simply cannot buy a better, higher quality awning than a SunSetter. You get custom-built features without the custom built price. Frost & Flame, your SunSetter connection! Let the Frost & Flame experts ask you the right questions and help you decide on fabric, color, style and accessories based on your needs. Then owner Steve Richard himself comes to your home to take all of the measurements. You never have to worry about someone with limited experience showing up. Lastly, all installations are done only by our own expert installers – never by a subcontractor. Frost & Flame, the trusted name for over 37 years. 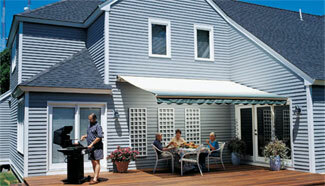 Let us help you decide which SunSetter Awning is most effective for your home and most cost efficient for you. Stop in or call us today! ALL Gas, Pellet & Wood Stoves, Fireplaces & Inserts - ON SALE! Display and Burn Models & Overstocks - ON SALE! SAVE up to $1000 OFF!!! EVERY Major Brand Under One Roof - One Stop Shopping!!! © 2019 Frost & Flame. All rights reserved.